As the rate of kids diagnosed with neuro-developmental disorders continues to increase, medical professionals and parents are taking a closer look at the relationship between gut health and brain function. 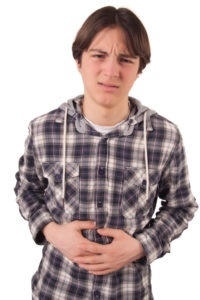 If your child exhibits symptoms of a learning or behavioral disorder and experiences gastrointestinal problems, leaky gut syndrome could be a contributing factor. Learn more about leaky gut syndrome below, and get tips to improve digestion and behavior today. What is leaky gut syndrome and how is it related to brain function? The lining of our digestive tract acts as a barrier with tiny holes that should only allow small, harmless particles to pass through while preventing waste particles and undigested food from escaping. However, if this lining becomes compromised or more porous than normal, undigested food particles and waste products can get through and enter the bloodstream. When undigested food particles and waste seep into the bloodstream, the immune system responds with inflammation throughout the body, leading to leaky gut syndrome. Inflammation can then lead to symptoms like bloating, cramps, constipation, diarrhea, headaches, fatigue, rashes, achy joints, allergies, and more. These symptoms, in addition to chemicals produced during this immune response, may be contributing factors for kids who struggle with behavior, focus, and learning difficulties. Kids with leaky gut syndrome may also experience vitamin and mineral deficiencies due to poor absorption, which can further exacerbate learning or behavioral struggles. While it is widely accepted that people with Chron's disease, Celiac disease, ulcerative colitis, and IBS often experience leaky gut syndrome, the idea that kids with ADHD and other neuro-developmental disorders may also be affected is gaining traction. In fact, recent research shows that kids with ADHD are significantly more prone to bowel problems than their peers, highlighting the need for more research to better understand the gut-brain connection. How can I improve digestion, gut health, and behavior in my child? As the medical community continues to investigate the link between leaky gut syndrome and neuro-developmental issues, the following information may be helpful for parents looking to support better digestion and improved behavior in their child today. Digestive enzymes - Digestive enzymes are proteins that are primarily produced in the small intestine and pancreas, as well as in saliva, that help break down the foods we eat into nutrients that can be absorbed and used by the body. Learn more about the benefits of supplemental digestive enzymes here. Probiotics - Probiotics are micro organisms like bacteria and yeast that aid digestion and support a healthy immune system in their host when they are consumed, but these organisms must be in balance to work properly. Learn more about adding probiotics to your family's diet and the importance of balancing gut flora here. Simple Diet Changes - Kids with neuro-developmental disorders like ADHD, Asperger Syndrome, Sensory Processing Disorder, and other behavioral issues often benefit from simple diet changes, as they are more sensitive to trigger foods like dairy, gluten, and artificial dyes. Consider making these three diet changes today to support improved health and behavior in your child.